This collection of fifteen methodological texts by a group of thirty international youth and social researchers is a polyphony of scholarly voices advancing the field of qualitative inquiry in youth studies. The book homes in on ways of adapting, remixing and reconsidering qualitative methods in order to better serve youth researchers in the twenty-first century. The texts included in this collection offer honest and open accounts of searching for, assembling, testing, and rejecting creative, well-known, or unconventional techniques from various methodical homes. 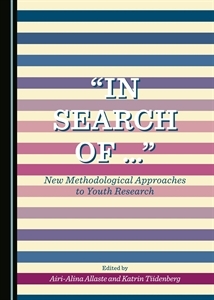 As is emphasized in the title, this is not so much an overview as an inquiry into conducting youth research in an environment that is constantly transforming. Researchers are always seeking out the best ways to capture and (co)-produce meaning that can be used for the greater good. This book offers fresh interpretations of, and feedback on, inventive combinations of methods, research questions and theoretical frameworks. It will be of interest to all who work in youth studies and sociology, and particularly useful to postgraduate students, junior scholars, and established researchers seeking to branch out into new terrain. Airi-Alina Allaste is Professor of Sociology at Tallinn University, Estonia. Her research, publications and teaching mainly focus on youth lifestyles, subcultures and participation. She also teaches qualitative methods to both graduate and PhD students. She has served as Working Package Leader and National Coordinator for various international projects, including the FP7-funded project “Memory, Youth, Political Legacy and Civic Engagement”, and is currently Vice-President of the Estonian National Sociological Association. Katrin Tiidenberg is completing her PhD dissertation at Tallinn University, Estonia, where she lectures in Sociology, Internet Studies and Research Methods. Her current research seeks to explain how photos (especially selfies) are used in people’s self-projects and in wider cultural narratives. Her scholarly interests include how self-exploration, community building and online interaction highlight issues of gender, sexuality and embodiment.